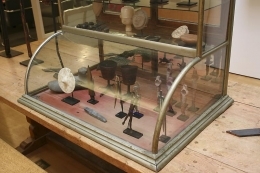 James Cohan Gallery is proud to present Cabinets of Curiosity, featuring over 50 objects ranging from 6,000 B.C. to 2011 A.D. Collected together, these seemingly unrelated objects from around the world collapse time and space. As a group the objects pulsate with a spiritual energy that comes from their capricious juxtapositions. 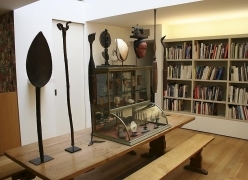 On their own, each object tells its own unique story of origin and use. The original curiosity cabinets—started during the 16th century—were often entire rooms that housed a broad collection of objects such as paintings and sculptures, natural and man-made objects, and objects with alleged magical qualities. 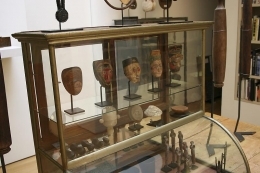 Our cabinets feature pieces from over twenty distinct regions—from the North American continent to Chad and Niger in Africa, from Mongolia, Uzbekistan and Afghanistan to the Korean Peninsula. They fall into a number of categories including natural and geological objects, ethnographic and anthropological objects, religious instruments, masks and curiosities. Highlights include a Danish Neolithic grey flint axe (2,000 B.C. ), an ensemble of European Bronze Age bracelets and hair spirals made of gold (1,000 B.C. ), and a set of miniature masks worn by monkeys that accompanied itinerant countryside theatre performances in Guizhou Province in Southern China during the 19th and 20th centuries. Cabinets of Curiosity is organized in partnership with Joseph G. Gerena Fine Art. About Joseph G. Gerena Fine Art Joseph G. Gerena Fine Art is a private gallery specializing in fine Asian, Tribal, and Ancient art, and magical natural and man-made objects. With over 34 years of experience, Mr. Gerena’s focus has always been on beauty over boundaries. The diversity of the material is a reflection of his fascination with the similarities of aesthetic expression that have, over time, found their way from culture to culture, the commonality of forms that emerge from human interaction, and the communication and convergence of spiritual beliefs.